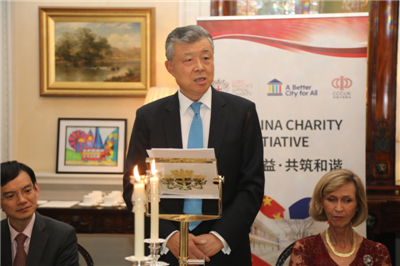 On December 3, 2018, Ambassador Liu Xiaoming and Madam Hu Pinghua attended the launch dinner of the China-UK Charity Initiative at the Mansion House in the City of London. The event was co-hosted by the City of London and China Chamber of Commerce in the UK (CCCUK). 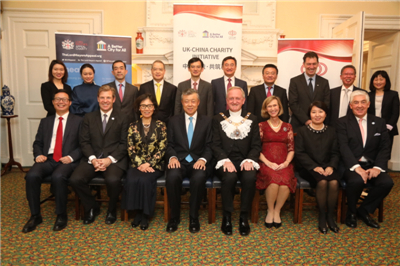 Peter Estlin, the Lord Mayor of the City of London and his wife, Geng Jinhai, Chairman of CCCUK, and John McLean OBE, Head of China-UK relations for The Lord Mayor's Appeal as well as representatives of Chinese enterprises in the UK were present. Ambassador Liu expressed his warm congratulations on the launch of China-UK Charity Initiative. He hoped that, in the spirit and with concrete actions of building a better city for all, the Initiative will help build three “bridges” between China and the UK. First, it will build a bridge of love to promote charities, so that China-UK cooperation on public welfare and charities will be enhanced and the development of charity work in both countries will be greatly facilitated to better serve the people of the two countries. Second, it will build a bridge of responsibility for upgrading China-UK cooperation, so that Chinese businesses in the UK will fulfill their corporate responsibilities, the ties between Chinese companies and the City of London will be strengthened, and China-UK trade and economic cooperation will be boosted. Third, it will build a bridge to the bright future of open cooperation by advocating openness, inclusiveness and win-win cooperation. In face of surging anti-globalisation, and looming protectionism and unilateralism, China and the UK must join hands to advocate open cooperation and continue to contribute to a brighter future of open world economy. The Ambassador expressed his best wishes for the success of the China-UK Charity Initiative in spreading love, lighting up hope and contributing to the China-UK “Golden Era”. 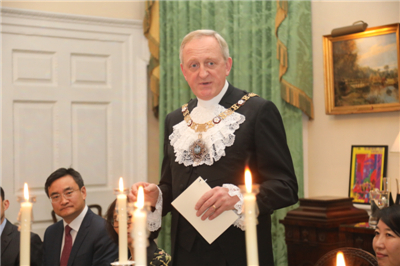 Lord Mayor Estlin in his speech spoke highly of the China-UK Charity Initiative jointly launched by CCCUK and the City of London and the Chinese businesses in the UK for their active participation in Britain’s public welfare. He said that, while the UK is committed to building a “global Britain”, it is even more important for China and the UK to establish good cooperative relations. He expressed the hope that in the future, more and more British and Chinese companies and individuals will join in to give back to the local societies and people. Chairman Geng said in his speech that the CCCUK is committed to providing quality services to Chinese companies in the UK to continuously enhance the exchanges and cooperation between Chinese companies and various sectors in Britain to contribute to China-UK charity and the “Golden Era” of China-UK relations. 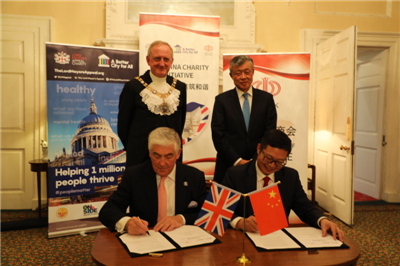 During the event, Ambassador Liu and Lord Mayor Estlin witnessed the signing of a memorandum of understanding between the CCCUK and the Lord Mayor’s Appeal.